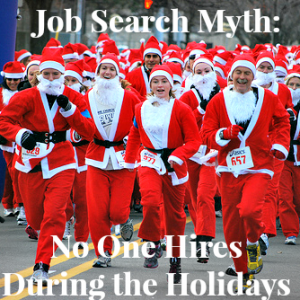 Employers don’t stop hiring during the winter holiday months. Use this time to research companies and apply for their fantastic jobs! Networking – Holiday parties are a great way to meet people and really connect on a personal level (focus more on personal conversation vs. your elevator pitch.) Don’t “elf” it up: Click here to read a great article on holiday networking. Get social – Take this time to update your social media profiles and ask your connections for references. The more people you’re connected with, the more you’ll be able to get some great career advice and job search assistance. Is your LinkedIn profile 100% complete?? Schedule it – Keep up with a full-time job search during this time of the year can be chaotic. Set a specific time of day where you’ll work on your job search as well as set job search goals you want to achieve. Every day has the SAME amount of seconds, minutes and hours – it’s what you do with them that COUNTS! Be proactive. APPLY – As winter approaches, the opportunity to apply for internships is coming to an end. The majority of companies recruit for Summer 2015 internships during Fall 2014. Don’t wait too long to get your foot in the door! If you’re looking for full-time employment, don’t wait until you’re a month away from graduation. Research and apply. Wouldn’t it be great to walk across the stage to get your diploma knowing that you have a great job waiting for you?? Above all, be sure to enjoy the holidays with friends and family. They want to support you. Stop looking at your smartphone and engage in real conversation. You’ll be glad you did. Happy holidays from Campus to Career!